I’ve always been creative and spent many hours making things, it pretty much carried me along for most of my childhood. My creatively was very chaotic though - all my thoughts & ideas thrown into water to create a very murky puddle. It wasn’t until last year that I actually found my focus. My work makes sense to me now, it reflects a fundamental part of me; my obsession with the wild, and it allows me to explore the world around me. Before this I would never consider calling what I did art – it was an almost desperate attempt to speak with a language I didn’t understand. So you could say that I haven’t seriously been make art until early last year. I could say landscape but I don’t actually think of myself as a landscape artist, even though technically that’s what I paint. 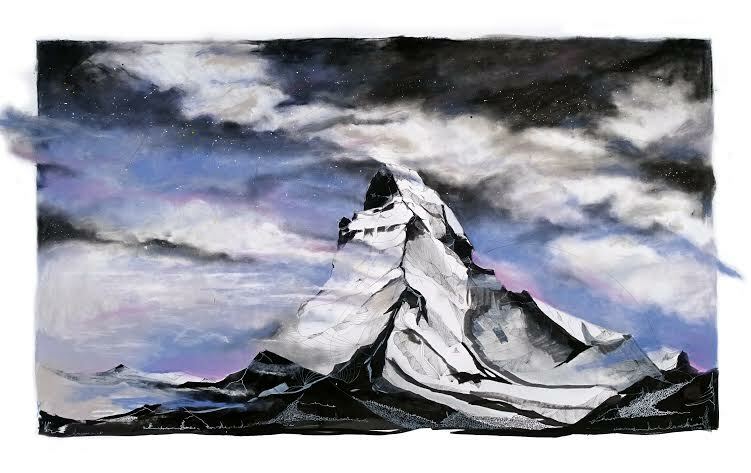 I paint ‘space’; immense, silent, lonely, unforgiving, bleak & beautiful voids. Not sure there is genre called ‘space’ art. But above and beyond the images I imprint on paper my work is about exploring our relationship with space and how these spaces change us. For example I strive to go to the Antarctica – I see this as a space which invokes an undeniable sense of ‘life’ in me against an immense backdrop of a raw and beautifully harsh space. My work is about that second (or minute if you can contain it) when there is sense of connection between two opposing ways of life, between you and the wild, and whatever that fleeting feeling is the genre of my work. My work began out looking very differently to how it looks now. I started out trying to be too faithful to my eyes. My work now is more about being faithful to my instincts and involves all my senses. I struggled for a long time to find focus, and more specifically to just let go of what I thought I should be drawing and how I thought I should paint. These spaces I paint have broken down all my silly self-imposed rules and helped me to throw caution to the wind and stop copying and start creating. I can only imagine my work will continue to evolve as I evolve exploring the world. 4) On Social Media you refer to yourself/art as 'Paint Plain', why is this? Paint plane refers to my Project Paint Plane which I began a year ago. This project is about creating an artistic interpretation of the wild world. It’s about travel and exploration and using art to connect with the world around you. On a very basic level it’s a map of places I go to record these lands through my art. My hope over the coming years (most likely tens of years) is to travel, explore and paint, to create a picture of every corner of the world. I’m fascinated by how people interact with space and how these spaces change us. PPP is my own interpretations but I would love to work collaboratively to begin to understand how other people interact with space, be it to live or to visit. 5) Do you paint on location or from photograph, what is your process? I take pictures and sketch to give myself references for shapes, but most of the work relies on my memories and feelings. I could never sum up a place with a one millisecond glimpse captured on camera. My work comprises of many memories of the space, its colours, its sound, my own reaction to the space and how it makes me feel throughout the days I am there. 6) Is there a medium or technique that you have yet to try but would like to? Yes many – I’m a technique hoarder! I’m always getting over stimulated and excited by new mediums. I would love to work with a more 3D medium, such as wood and metal and I’m fascinated by the historic and earthly processes of working a piece of wood or metal. 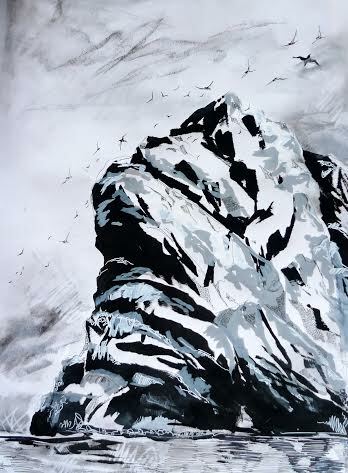 But most of all I love the idea of working with the mediums of the subjects I paint – rock, ice, water. Don’t ask me how at this stage - it’s another fleeting excitement of an idea which needs to calm down before I can rationally consider how I would work with it. 7) What would your ideal solo exhibition be like and where would it be held? Strangely I see my solo show to be a collaborative exhibition, involving many reactions and interpretations of a single space. It’s the process of being in a space and the changes that happen I am fascinated by, and not just my own reactions. It is this process, as well as the finish work, I want to exhibit.I could go on but I tend to waffle so I’ll just say that I can see this exhibition working away from the place the exhibition is inspired by, so most likely a city; two very different spaces, one tamed by life and the other untamed by nature. Though I also love the idea of placing an exhibition on the exact opposite side of the globe to the exhibitions inspiration – I would be fascinated to know the planet’s physical opposite to a space – like a space ‘colour’ wheel’ though I would image I would end up with a lot of sea inspired exhibitions. 8) Do you have a favourite artist or painting? This sounds bad but I don’t. Even worse is that I have never been inspired by art, but instead by my subject. That’s not to say I don’t love art, as I do, but I love the process involved in art not just the end result. I could tell you my favourite views, smells, my favourite feelings, and shapes but not my favourite piece of art. I suppose you could say my favourite piece of art therefore is the art you don’t see, the spark of inspiration & life that is the beginning of the end result. 9) If you could change anything about the art world, what would it be? This is hard question, I’m not sure I know enough of the art world yet to give a good answer. I could be business minded and say pricing – it’s so hard and also so unrelated sometimes it’s mind boggling. Not sure how I would change this but art sometimes seems more about the artist and celebrity instead of the art. 10) What are you planning to exhibit at the New Artist Fair in March 2015? 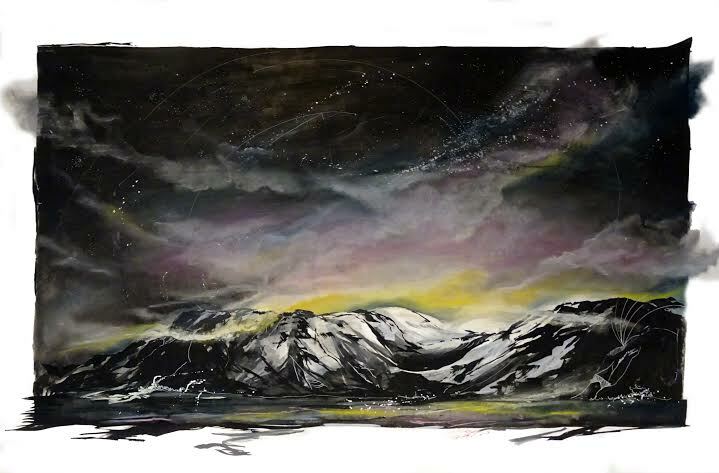 The work I will be bringing to the fair will be inspired by my time in the Arctic Circle and Norway. It’s a space that demonstrate everything I am about. Svalbard, Greenland, Arctic Circle and in fact Antarctica have always been places I have dreamed of visiting. These white lands create the most amazing colours. The only sound you hear is the distant crack of breaking ice or the slow movement of the snow amongst the beautiful emptiness. They truly are unfathomable, unforgiving and beautiful lands. Life is hard in these places but life exists, is that not amazing? - The amount life strives to live in unlivable places.